When I lived in Japan after college, I got hooked on Japanese curry. It's everywhere, as ubiquituous as pizza is in the U.S. It's served on a daily basis in schools and factories. "I MUST have Japanese curry." We looked in the phone book and found a Japanese hibachi restaurant. Yes, I said "phone book." No wisecracks. I called hurriedly and said, "Do you have Japanese curry?" No was the answer. I proceeded to call all the Japanese restaurants in town and got the same answer, until I called the last one, and they said Yes. "Yes, we have curry, but it's only for the workers." Since then, I've found the local Japanese food store and can buy boxes of Japanese curry to my heart's content. The curry comes in blocks, almost like the blocks of baking chocolate. I usually buy S&B brand Golden Curry, medium hot, because that's the one my Japanese neighbor told me to buy when she taught me to make curry. The other big brand is House Vermont Curry. Since curry was introduced to Japan via the British, the curry is made like a gravy with a roux and is fairly mild. Almost any palate can enjoy this curry, and it's a great introduction to curry for those who say they won't like curry. I warn you that it's addictive. With white rice and a sprinkling of Japanese red pepper, ichimi togarashi, you'll be a goner. Heat a dutch oven over medium-high heat. Add a little oil and brown meat on all sides, making sure that there is air space all around the meat and the pan is not crowded. Cook meat in batches if necessary and set aside. Turn down heat to medium, add a little more oil, and brown onions until translucent, about 5 minutes. Add back meat to the pot and add water or beef broth. Bring to a simmer and cook until beef is tender, about 1 1/2 hours. (You can also do this in pressure cooker and cook the beef for 35 minutes). When the beef is tender, add the potatoes and carrots and cook at a simmer until they're tender. Take 1/2 of the curry in the box (there should be two containers in the box, so you would just use one of them) and cut it up in smaller pieces. Put it in a bowl and add some of the water from the pot and mix to dissolve the curry cubes. Add to the pot and mix carefully, so you don't break up the potatoes. If the curry is too thick for your liking, just add more water until it's the right consistency. Serve with white rice and ichimi togarashi. I had a Japanese neighbor in the 80's..Tomiko..She made this for lunch for us one day..I bought the curry afterwards a few times and I loved it..You have just reminded me..I hope they still have it..
Oh yes...I think I will have some! I have to see if I can find that block of curry...I love trying new ingredients. Looks so delicious! I read your description of 'Japanese' curry with interest. The very same thing is sold in every Chinese Takeaway in the UK and is known as Chinese curry made with chicken, duck, char sui, beef, prawns etc or as a mixture of all of the above called Special Curry. The Golden Curry mix to make it is now bring sold by many local supermarkets. I've known it all my life but never as Japanese! Sounds just like Mom's curry recipe, right down the the type of curry roux she uses. If you ever want to try to switch things up a bit, use sweet potatoes rather than white potato. Using pork instead of beef is tasty too. When I use pork, I use a fattier cut like pork shoulder steaks. 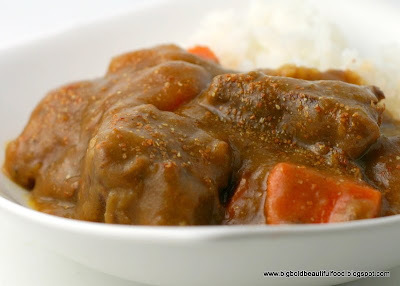 I adore Japanese Curry...I don't make it too often though as I like serving mine with fried chicken or pork cutlets (katsu) so it's rather sinful! Wow, you've lived in Japan? I'm jealous!!! I've heard of people using bananas and even chocolate in Japanese curries. Yours looks very authentic. 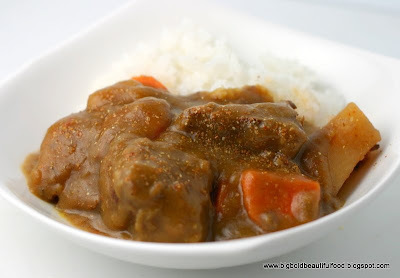 I recently posted a Hawaiian/Japanese Curry on my blog...mygrandmasrecipebox.blogspot.com. Some similarities you might recognize. We have both brands in Singapore! S&B especially. I love it. I love it so much I totally understood when you wrote that you cried. LOL. I spent my formative years eating curry at ALL the Japanese restaurants my parents brought me to. Call me a late bloomer but I wouldn't discover the finesse and culinary pleasures of Japanese dining for years well into my teenagehood. Blame it on the curry, but I still love it tons.